Today is a great today. After much patience and hard work and cooking and writing and stressing I am so excited to announce that I am writing a book! It will be published by Little, Brown and I could not be more thrilled. Yummy Books has been my greatest joy these last three years and I never could have taken it this far without all of you. I plan on doing some exciting things on the site in the next couple of weeks as a thanks to you all, so keep reading and cooking and being cool and stay posted! Also subscribe to the blog or follow along on twitter, facebook or instagram for updates. When people talk about Les Misérables it’s rare that they’re talking about Victor Hugo’s 1862 novel. Embarrassingly enough, until I was fifteen, I didn’t know that it was a book at all. I did, however, know a good bit about the musical from one of my childhood best friends, Julia. She was obsessed with it and every year her parents took her to New York City to see it. Julia was the ultimate girly-girl and her bedroom was absolutely fascinating to me—-all floral country bedding and lacy bed-skirts—it was nothing like the bedroom I shared with my sisters, my corner of which was covered in reproductions of antique baseball cards that I had bought at Bop City Comics and stuck to the wall with my older sister’s braces wax. The centerpiece of Julia’s bedroom was her most prized possession: a dome-shaped glass music box filled with fiber-optic flowers that spit light like some kind of deep-sea amoeba and swayed to “Castle on a Cloud” when she turned the dome’s big iron crank (and she, of course, was the only one who was allowed turn it). I hated that thing and wanted it, needed it, in equal measure, it tortured me. Years later, my aunt gave me a beautiful copy of Les Misérables as a fifteenth birthday gift and I learned for the first time that it wasn’t just a musical but a book—an enormous and very serious-looking book—one that looked nothing like the inspiration for Julia’s dome of flowers or the precious song that emanated from it. I tore through the book in a week and a half, staying up late and neglecting my freshman year assigned reading to find out whom Marius would end up with. I loved Jean Valjean through all of his transformations and missteps, going so far as to scribble his name inside of a heart in the bathroom stall at school where every girl wrote the initials of her crush in ragged ballpoint pen (I feel very raw admitting this). Despite my love of the book, I still have yet to ever see the play, and as of now still haven’t gone to see the movie. It could be that the play will always be too much associated with Julia’s girliness, or that in general I despise musicals (which could, at its root, also stem from Julia), but since Christmas, every time I am about to buy a ticket to go and see the movie, I just can’t bring myself to do it. The constant loop of the movie’s trailer on TV and the barrage of posters in every subway did fill me with the desire to read the book again, though—a decision that immediately thwarted my New Year’s resolution to eat less bread in 2013. Any post about food in Les Misérables, or really any post about Les Misérables in general, would be incomplete without the mention of bread. The entire plot of the novel is driven by Jean Valjean’s nineteen-year imprisonment for stealing a loaf of bread to feed his starving family. The French Revolution is always quietly (and sometimes not so quietly) present in the novel, which mostly takes place in 1815, only 15 years after Marie Antoinette reportedly declared “Qu’ils mangent de la brioche” upon hearing that the peasants had no bread to eat. Throughout the novel, people’s stations and the direness of their situations are often described in reference to whether or not they have bread, or, more specifically, what kind of bread they do have. When we first meet Jean Valjean he has just been released from prison, and he is wandering through Digne starving after being turned away from every inn and household for being an ex-prisoner. Finally, he is sent to the Bishop Myriel’s house, where he is given one of my most favorite literary meals. The meal is beautiful in its simplicity, and especially satisfying after reading pages and pages describing Valjean’s desperate hunger. 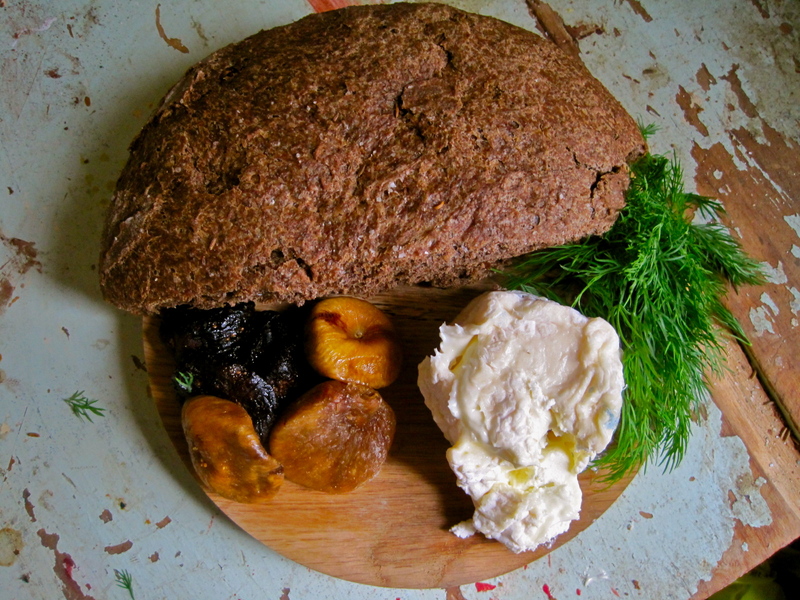 Black rye bread was especially prevalent throughout France at the time Les Misérables was written, it was a staple for lower and middle class people alike, and was one of the main foods provided in prisons like the one Valjean lived in for nineteen years. 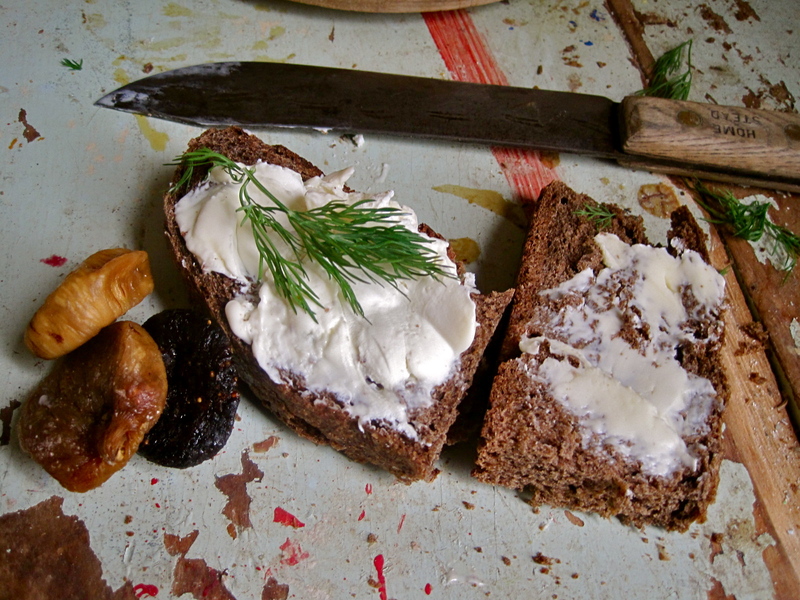 This black rye is nothing like what Valjean would have eaten in prison, it is sweet and bitter and complex and incredibly delicious. 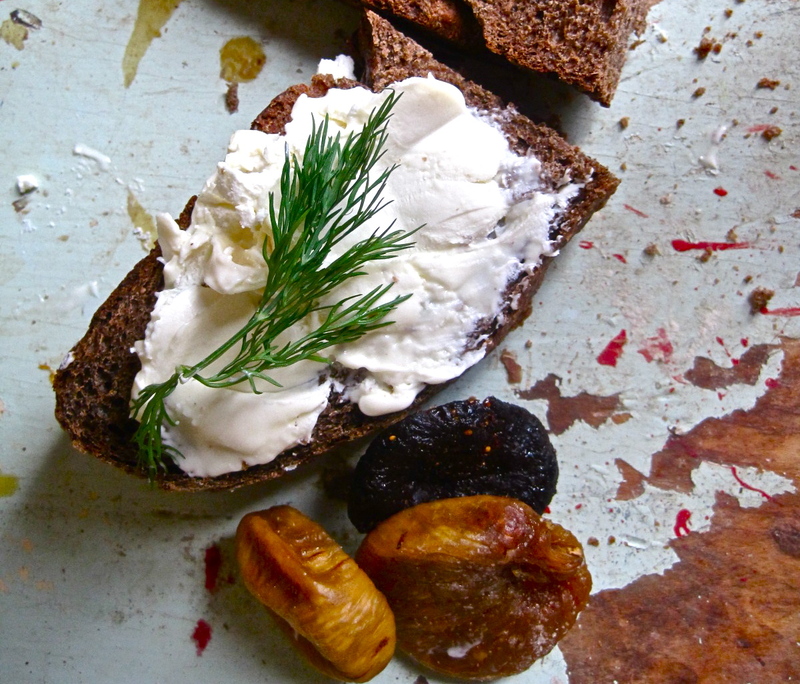 I ate mine with a stinky soft cheese and figs for extra literary meal authenticity, but feel free to top it with whatever you like. It would be great with cream cheese and lox, or honey and butter, or even some almond or cashew butter–really, I can’t think of anything that it wouldn’t compliment, go nuts! On a separate note, if you enjoy Yummy Books I would love to connect with you! I love knowing more about my readers– so subscribe, comment, email me, or “like” Yummy Books on Facebook for more updates. Also, if you have instagram or twitter you can follow me there for updates both Yummy Books related and not, As always, thank you for reading, I really like you all a lot. 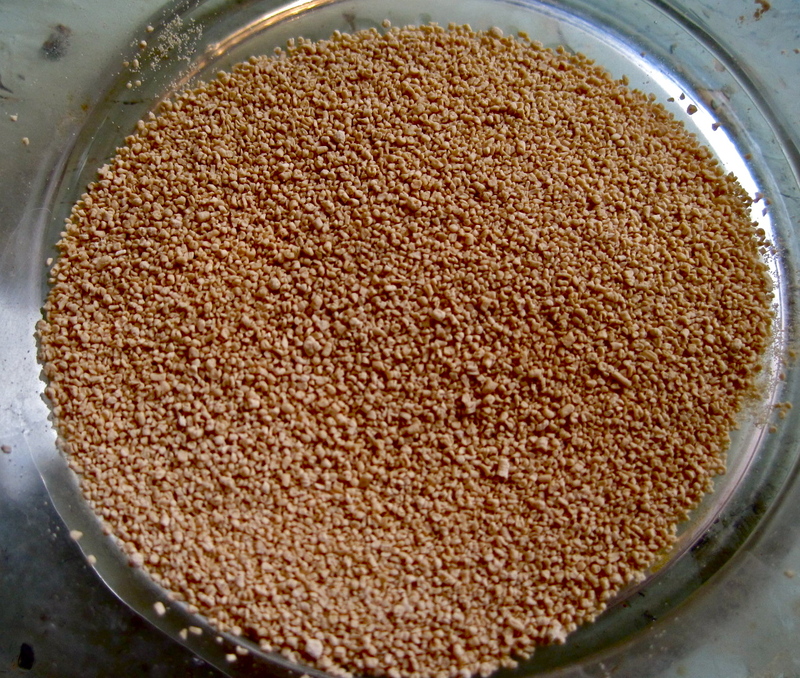 Place your yeast in a small bowl and combine it with dark brown sugar and 1 1/3 of your warm water to activate it. Within about 5 minutes the yeast should be foamy—if it isn’t, toss it and start again (you had a dud yeast packet). 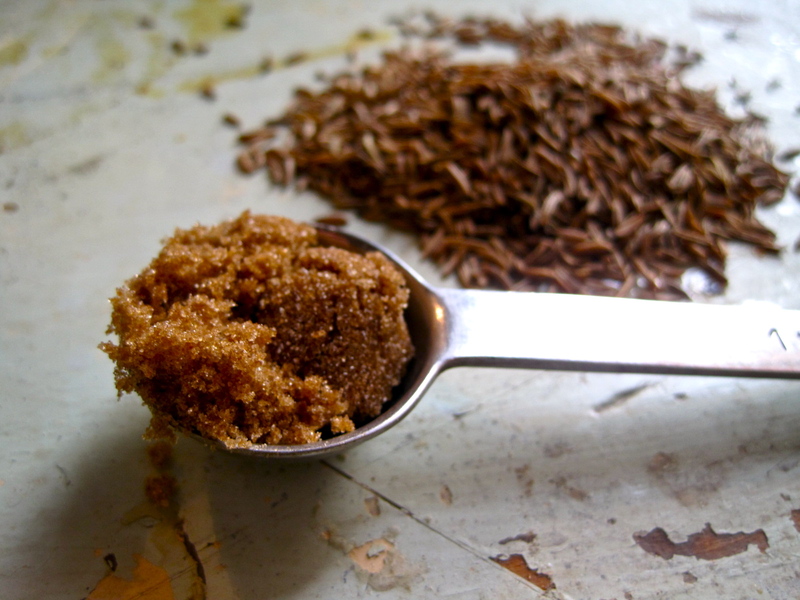 While you are waiting for the yeast to activate, combine your cocoa powder, espresso, molasses, caraway seeds, butter and salt in a medium saucepan and stir constantly over medium heat until butter is melted and ingredients are well-combined. Add molasses mixture to active yeast mixture (molasses mixture should be warm, not scorching hot when you do this), and pour into a mixing bowl fitted with a bread hook attachment. 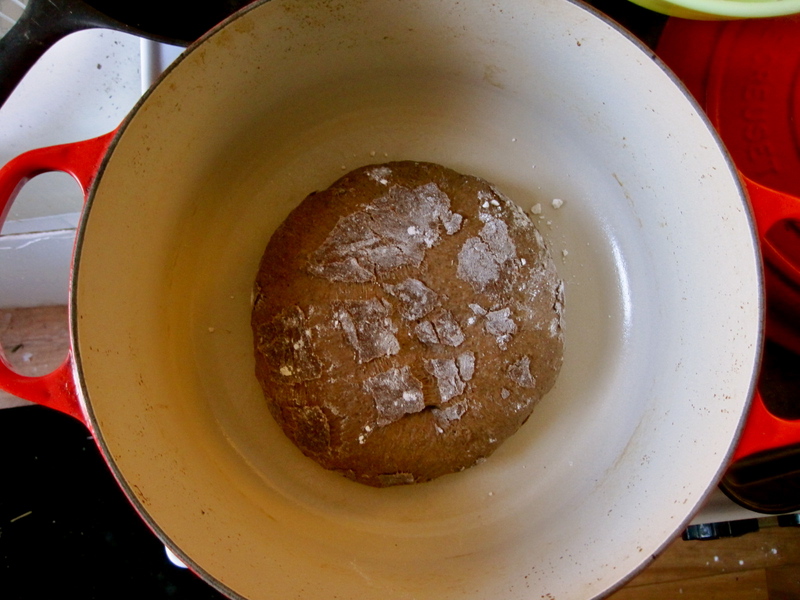 In a separate bowl mix rye and bread flour together and with your mixer running, slowly add flour to molasses/yeast mixture. One everything comes together knead the dough for 5 minutes or until dough is pulling away from the sides of the bowl and hugging the bread hook—dough should also spring back when you poke your thumb into it. 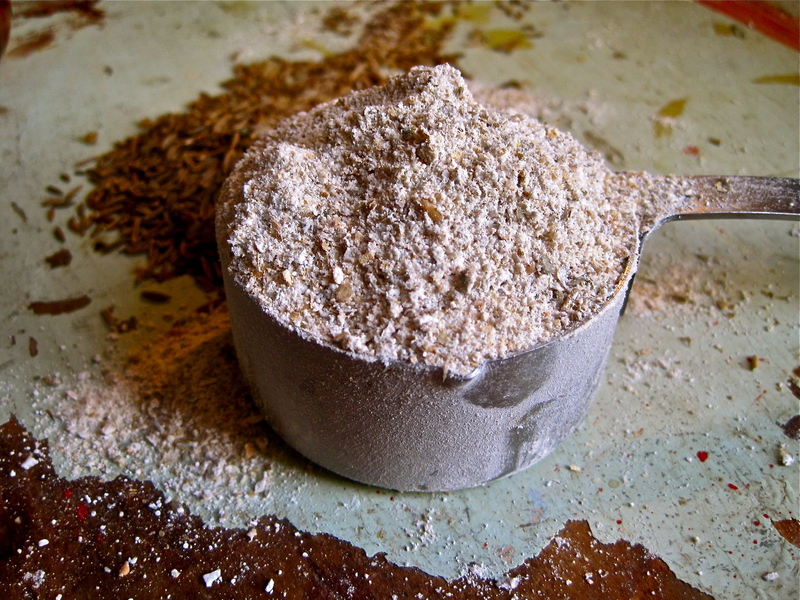 If it is too dry, add more water, or if it is too wet add more flour, until you get the desired consistency. 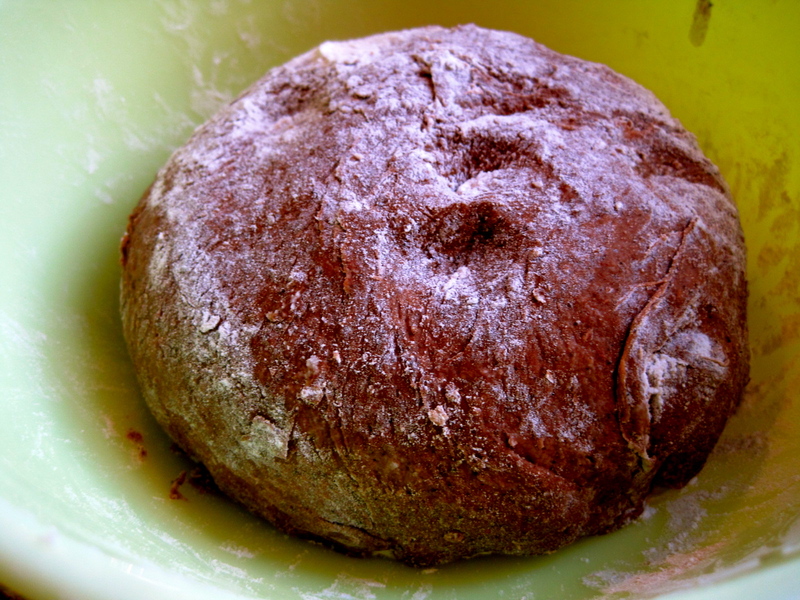 Shape the dough into a ball and place seam-side down in an oiled bowl. Cover loosely with a towel and let it rise for 2 hours in a warm place. After 2 hours, punch down the risen dough with your fist gently (yes, I said punch it gently), and turn it out onto a floured surface. Shape the dough into your desired shape, place it in your dutch oven (or any heavy-bottomed, oven-safe dish with a lid) and allow it to rise for another 1-2 hours, or until doubled in size. 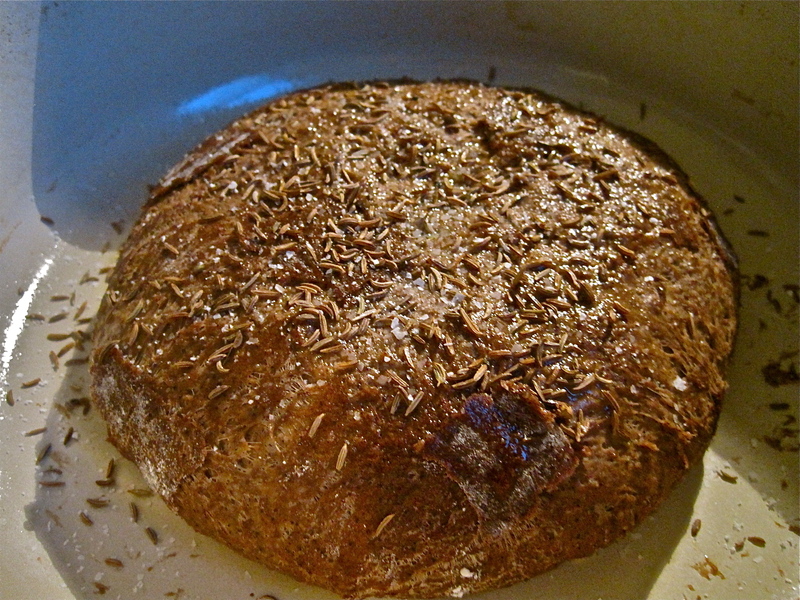 Once it is doubled in size, turn your oven to 425, brush the bread with olive oil, sprinkle it with caraway seeds and sea salt. When your oven is up to temp, place bread in and bake for 20 minutes with the lid on. After 20 minutes remove the lid and turn the heat down to 350, bake for another 20-25 minutes. Top with whatever you like and enjoy! One of the little boys I babysit for has, in the last few weeks, become completely obsessed with trains. At only four-years-old he has the New York City subway map memorized and can tell you a variety of ways to get to Times Square from wherever you are, what trains you can transfer to at Union Square, which trains run express and which ones local–something that, after almost ten years living here I still mess up daily. It seems like the train-loving phase is one that most little boys go through at one point or another and I find comfort in the fact that, in a day when seven-year-olds have their own iPhones, a child can still be awed by a technology invented in 1784. As much as I respect Arlo’s newfound obsession, it has made agreeing on a bedtime book very hard. His older brother, Max, has long since moved on from his own train fixation and, understandably, doesn’t want to hear about signaling systems and high-platform loading before falling asleep. Max is an avid reader and reminds me a lot of myself as a kid—he craves adventure and magic, something to get his imagination working and his heart racing, something that will make his dreams bizarre and spectacular. The other night, with the clock quickly pushing toward “really past your bedtime” and my patience wearing thin, I saw The Polar Express pushed to the back of the bookcase, shining like a beacon of hope. Miraculously, the boys agreed to it, and for the next twenty minutes were absolutely entranced. Van Allsburg’s drawings remain, to this day, some of the best children’s book illustrations of all time–there is a softness to them that is both comforting and quietly eerie. The Polar Express received rave critical reception when it was published in 1985. It won the Caldecott Medal for children’s literature in 1986 and continues to make the School Library Journal’s list of “top 100 children’s books of all time” every year. It wasn’t until the movie adaptation came out in 2004 that people’s opinion of the story began to change. The huge-budget CGI movie, in which every grown-up has the ever-comforting and familiar voice of Tom Hanks and every child the blank stare of a zombie, incited criticism from publications like The New York Times for its eerie similarities to Reifenstahl’s Nazi propoganda film, “The Triumph of the Will.” Websites dedicated to outlining the similarities of Santa and Hitler popped up everywhere, changing many readers’ perception of the book forever. I wasn’t aware of any of these criticisms until I decided to look up critical reception of the book after reading it to Max and Arlo last week. I had forgotten what a strange, uneasy feeling the book had given me in my guts as a kid, I always sort of dreaded my dad’s reading of it around Christmas time. I couldn’t get past the fact that the book’s main character isn’t at all weirded out when a creepily old-fashioned train pulls up outside of his bedroom window and a conductor–a man he does not know–starts beckoning to him from it. What’s more, this nameless main character leaves the comfort of his bedroom and hops right onto the train, which is full of children, all lured from their homes in the middle of the night to take a trip to a very far away place. One thing that I did love about the book, however, was the description of the hot chocolate that the kids drink while on board the train—hot chocolate that is “as rich as melted chocolate bars.” This was something I could really get down with. Hot chocolate played a huge role in one of my most favorite Christmas traditions. Every year, my dad would take me and my sisters Christmas shopping, one at a time, in the three days immediately before Christmas. Getting to spend an entire evening with my dad without my sisters was very exciting. We walked around looking at all the Christmas lights, talking about school and books and carefully choosing gifts for my mom and each of my sisters. What I liked best about this tradition, though, was that when we were done shopping my dad always bought me a fancy hot chocolate from Au Bon Pain. Before my dad introduced me to the fancy stuff I was used to Dunkin Donuts hot chocolate–thick and overly-sweet, coming out of a machine with the push of a button, or the gritty, artificial packets of Swiss Miss that my sisters and I always stirred into water and zapped in the microwave, so at first I wasn’t sure if I liked this serious, grown-up version of hot chocolate. Soon though, I began to crave the bittersweet chocolate, the milk scalded by the handsome, teenage barista until it was almost burnt. Hot chocolate is, today, still one of my most favorite treats, and it never fails to bring me comfort. This is a recipe I created during my pastry days at Colonie. It became a tradition to make big, steaming mugs of it to get me and my fellow cooks through the freezing, two-hour-long Sunday evening walk-in-refrgerator deep-clean, which strangely, is one of my most favorite memories of my days working there. This recipe makes a pint of ganache that can be scooped into your mug and doused in scalded milk (or cream if you’re feeling dangerous) whenever you have a hankering for hot chocolate. My mom always used to put chocolate oranges in our stockings at Christmas, so I have a real soft spot for that flavor combination. If you don’t, feel free to skip the orange zest and juice, but do try it once before you skip it—it’s fancy and delightful. I love this method because it keeps forever and easily makes a single serving, which makes it dangerously simple to always have a very decadent treat on hand. It also makes a great gift for anyone you love or are trying to make fat. Pour cream into a medium saucepan and add vanilla extract. 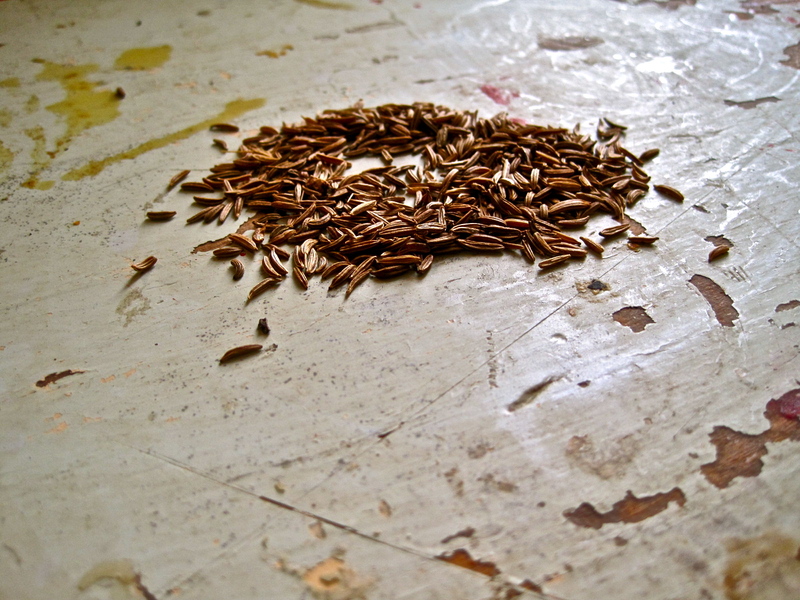 Split vanilla beans lengthwise, scrape seeds into the cream and place pods in the cream as well. Place chocolate in a heat-proof bowl with orange zest, juice, and spicing and set aside. Scald cream over medium heat (scalding comes just before boiling, watch for small bubbles forming around the edge of the saucepan and steam rising from the cream’s surface). Once scalded pour cream over chocolate and let stand for 30 seconds. After 30 seconds whisk chocolate and cream together until smooth and shiny. At this point the ganache will be the texture of chocolate syrup but once it’s refrigerated overnight it will firm up to a soft, scoopable, fudge-like texture. For a single serving of cocoa, add about 2 teaspoons of ganache (or however much you like) to a mug, scald a cup of whole milk or cream, and pour it into the mug over the chocolate. Stir and top with marshmallow fluff (recipe follows). Store the rest of the ganache in the refrigerator, it will keep up to two months. Marshmallow fluff is a childhood staple—or it was for me, at least. We ate it with absolutely everything growing up and corrupted more than one neighborhood kid whose parents wouldn’t allow them to have sugar. We didn’t have very interesting toys, but man did we have fluff. As much as I love the supermarket stuff, making it from scratch is a giant improvement. Don’t be scared by the boiling sugar and the candy thermometer, making it is insanely easy and hugely impressive. In a medium, heavy-bottomed saucepan stir together sugar, corn syrup, water and salt. Fit saucepan with a candy thermometer. Before turning stove on, mix together egg whites, cream of tartar, vanilla and vanilla bean seeds in the bowl of a mixer fitted with a whisk attachment. Turn mixer to medium-high and return to stove to boil your sugar mixture. Heat until thermometer reaches 240 degrees Fahrenheit. At this point your egg whites should be whipped to soft peaks (if you notice that your egg whites are whipping faster than your sugar is boiling simply turn the mixer off and resume when the sugar syrup is getting closer to temp). Once syrup is at 240 and egg whites are holding soft peaks, pour sugar syrup into a vessel with a spout, such as a measuring cup, for easy pouring (be very careful, hot sugar syrup is not something you want to splash on yourself). With the whisk on the mixer running at medium, very very slowly pour about 2 tablespoons of sugar syrup to allow the whites to come to temp without scrambling. 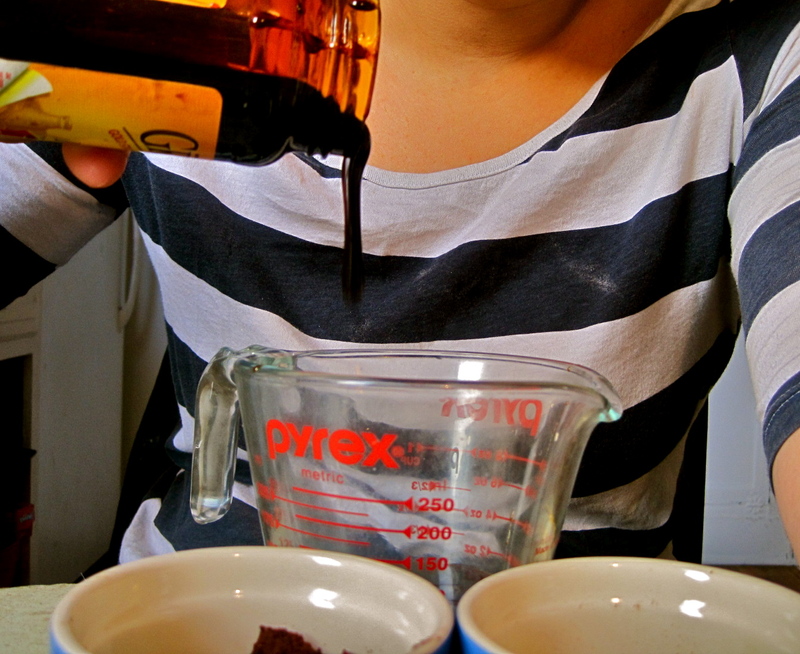 Once those two tablespoons are incorporated you can pour the remainder of the syrup in in a slow and steady stream. Continue whipping until mixture is glossy and holding medium-stiff peaks (or until it looks like marshmallow fluff!). Serve immediately with hot chocolate or refrigerate—will keep for up to one month.